Capsicum Roll-On Heat Booster was developed to deliver a safe and effective boost of heat to enhance your pain management. It is packaged in a massaging roll-on application with natural herbal ingredients. It is to be used only as needed for challenging days in which the pain proves persistent and continues to linger on. 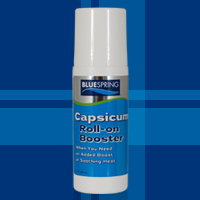 Created by BLUESPRING to deliver a safe and valuable boost of heat to enhance your pain management, the Capsicum Roll-On Heat Booster provides a relaxing, massaging burst of warmth through its unique application. 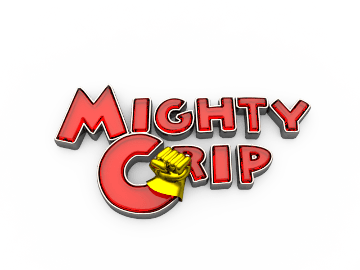 As a natural joint and muscle pain relief solution, the product further increases the pain-relieving power of Super Blue Stuff OTC and Super White Stuff OTC. The combination of various natural ingredients are formulated to provide a product that complements other BLUESPRING products, but is also extremely effective on its own. Whether it is a stiff neck or an aching back, everyone’s pain proves to be unique. Keeping this in mind, BLUESPRING offers a unique solution for any daily discomfort that may come your way. With just an extra boost of warming relief, the Booster should do the trick to conquer unrelenting pain. Capsicum Roll-On Heat Booster does not have to be used everyday or made a part of your daily routine. Swipe it on when a specific part of your body is sore and could use some extra attention. Instead of counting on prescribed pharmaceutical drugs to stop your suffering, rely on the safer alternative that is sure to impress. No need to increase your medication dosage when you can choose the amount of natural pain relief cream you need to feel comfortable again. Capsicum Roll-On Heat Booster is comprised of 5 ingredients known to be magnificent for pain relief. Capsicum frutescens, aloe barbadensis, arnica montana flower, olive oil, and emu oil all make up a powerful formula for instant relief. With natural, wholesome ingredients whose pain relieving properties have stood the test of time, people of all ages can reap the benefits of this topical Booster. Given its ability to be used while also taking prescription medications, Capsicum Roll-On Heat Booster has proven much success as it works quickly and effectively. Just a small amount can relieve tremendous discomfort when used with Super Blue Stuff OTC or Super White Stuff OTC. Its healing powers are strengthened, however, with the help of regular exercise. Aerobic exercises such as jogging, swimming, cycling, and walking can all lead to weight loss. In turn, this results in less stress on the knees, hips, and other joints. Paired with the Booster natural pain relief cream, sore muscles and joints should be a thing of the past. Taking action now can lead to a healthier, more comfortable lifestyle in the future. WHAT INGREDIENTS ARE IN CAPSICUM ROLL-ON HEAT BOOSTER? Some of the healthy ingredients found in Capsicum Heat Booster by BLUESPRING have been scientifically proven as natural remedies to help the body boost the relief of pain. The effectiveness of this formula is due to the unique blend of highest quality ingredients. The combination of natural ingredients is carefully formulated and documented to provide a heating warmth and relief. What makes this Booster powerful is in its twofold results. It is made to boost and complement the BLUESPRING pain relief products but also works effectively on its own. The extract of the capsicum frutescens has been proven in multiple studies to act as a remarkably powerful local analgesic. It is believed that this effect derives from the dilation of blood vessels near the application site. In some products which maximize this extract's positive effects an immediate lessening of chronic pain is produced. Many people enjoy the heating warmth it brings to a pain relieving remedy. The anti-inflammatory effects of Aloe Barbadensis leaf extract have been extensively documented, and in fact some extracts have been shown to out-perform modern pharmaceutical ointments in topical applications. When used in concert with capsicum extract, Aloe Barbadensis leaf produces a remarkably swift easing into relief. This trait can be seen in Aloe's time honored role as the first line soother for sunburn. The Arnica Montana flower, or the famous wolfs-bane, is a beautiful and relatively rare mountain flower that flourishes in Europe's mountainous corners. It has a long and storied place in the annals of old world herb lore, and was used extensively as a poultice for localized pain relief throughout early and middle antiquity. The anecdotal evidence for this beautiful blossom's medicinal efficacy provides a foundation for modern studies, which have yielded startling results. Arnica Montana extract has been shown to be as effective as ibuprofen for topical pain relief, when the samples of each are adjusted to present an equal potency. In the Minoan culture that flourished on the Greek island of Crete nearly five thousand years ago, olive oil was a ubiquitous part of daily life. There is some evidence in the archaeological record suggesting that these vanished people even used olive oil in lieu of soap. Modern cosmetic and pharmaceutical manufacturers are aware of the olive's cleansing and healing properties, and it is often a key ingredient in effective pain relief products.